Excerpt from Communist Infiltration of Hollywood Motion-Picture Industry, Vol. 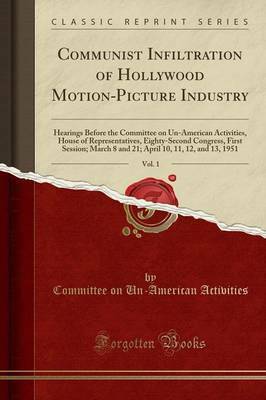 1: Hearings Before the Committee on Un-American Activities, House of Representatives, Eighty-Second Congress, First Session; March 8 and 21; April 10, 11, 12, and 13, 1951 Let the record Show that Messrs. Walter, Moulder, Doyle, Frazier, Velde, Kearney, Potter, and Wood are present, a quorum. About the Publisher Forgotten Books publishes hundreds of thousands of rare and classic books. Find more at www.forgottenbooks.com This book is a reproduction of an important historical work. Forgotten Books uses state-of-the-art technology to digitally reconstruct the work, preserving the original format whilst repairing imperfections present in the aged copy. In rare cases, an imperfection in the original, such as a blemish or missing page, may be replicated in our edition. We do, however, repair the vast majority of imperfections successfully; any imperfections that remain are intentionally left to preserve the state of such historical works.